– Pigs, cows & chickens running around! – Barrels, wheat field & more! Only NPCs actively contributed to the core mechanics of the game – the rest was pretty much *juice* as they call it. Some items required re-shuffling the code a tad, for example the parallax core was entirely revamped. The rest was essentially a lot of time on Pixartu, drawing assets & importing them to the game! This can seem out of place, considering the general attitude I have adopted towards the project. In my previous post, I was a strong advocate of tightening the scope of a project – Prioritising the completion of a project first, before adding goodies the game can do without. So why I have I spent so much time on seemingly low value items? Reason #1: The village is meant as a safe-harbour for the player – a place to relax between dungeons. This is where he/she can pick a hero, weapons, purchase/organise equipment & gems etc. 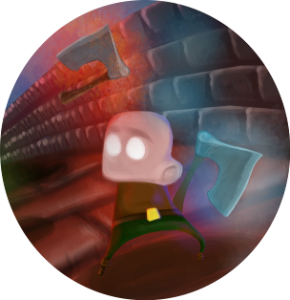 Most of the the game plays in dungeons, where the player only sees tiles & walls. Whereas the village has a nice dynamic sky that goes from day to night, and I wanted it to feel full of life. Reason #2: This is the first level new players will see and therefore it should leave a positive impression – hopefully enough to convince them not to uninstall the game within a minute of booting it! First and foremost, where does the idea of a village for Dungeon Scroller originate? The direct inspiration for building a A-RPG comes from Diablo, so no surprise there: Dungeon Scroller’s village is inspired by Diablo’s Tristam. It serves the same purpose: a place to heal and upgrade the hero, but with a twist. One of my objectives with the village is to have a level which offers exactly that, but without the need for cumbersome menus. As part of my “keep it simple” belief, from the start of the project I have thought of ways to not have any in-game menus at all. My idea is to use the village to select heroes and weapons, without ever having to go into a selection or inventory menu. 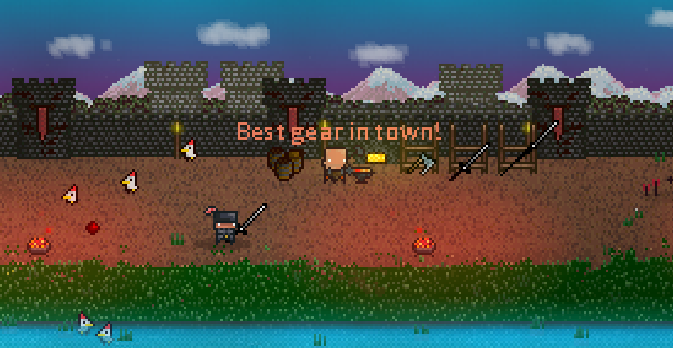 At the beginning of the game, the player can simply click on the hero he would like to control (much like the campfire in Diablo), or run over a weapon from the blacksmith’s shop to select it. This goes back to my earlier gaming days. My favourite games were Arena (the first game of the Elder Scrolls series) and before that Ishar, one of the first Dungeon Master clones to take place outdoors. Both allowed an extraordinary freedom of movement, which was impressive considering it was back in the Atari and early PC days. Arena – The Elder Scrolls; the game is actually free to download on Beteshda’s website! Ishar – I did an internship at the company behind this game (Silmarils), but that’s another story! Bottom line: I really wanted some outdoor space in Dungeon Scroller, so I could mimic the impression of freedom I remembered from these two games. Hence the parallax background! One technical detail: Dungeon Scroller’s actual game view (i.e. excluding the bottom menu) is 144 pixels high. 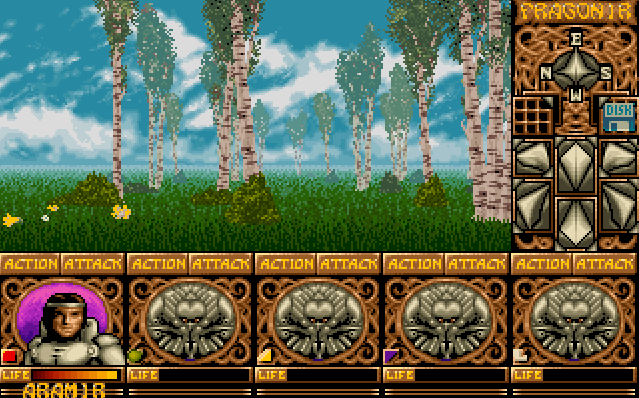 In dungeons, 26 pixels high walls block the player going up outside the screen and down under the menu. That’s basically 144 – 52 = 92 pixels of walkable dungeon high space. Plenty of space to attack & dodge monsters! The village walkable space, on the other hand, is restricted to 144 – 80 = 64 pixels. That’s a lot narrower! Why? The skyline of course! I built the initial village to have the same dimensions as the dungeons, however the result was a bit claustrophobic. Since there are no monsters or attacks to dodge, I decided to sacrifice player mobility to open up the world a bit. I wanted the village to feel like a safe haven, so what better place to add some wildlife and NPCs? In Arena the Elder Scroll, towns were full of people walking around, which gave them a living & breathing feel. Chickens, pigs and blacksmiths are all NPCs in the game, and although you cannot have conversations with them, each have one liners – from *cluck* for chicken, to the blacksmith selling his wares! I’ve created a day/night cycle for the skyline, to make the village feel more dynamic. Since the Village also has lighting, depending on the time of day, it can have a different outlook altogether. Once again, Arena is my source of inspiration! I have fond childhood memories of coming out of a dungeon (which due to the narrow field of view, felt very claustrophobic!) and arriving at a town just for sunset. I used to feel relief for my in-game Spellsword! Before I even started on Dungeon Scroller, I knew I wanted to emulate the same feeling of openness. So, when I started working on the game, I made sure there was an opportunity to have a day/night cycle in the open-sky village layout. I am happy with the final result…. As usual, I would love to hear from you if you have any comments or further ideas! Please leave a comment or drop me a note!